North Carolina’s 12th Congressional District has a storied and controversial history and the likelihood is that the district will garner even more attention when a variety of events converge within the next few months. With Congressman Mel Watt’s nomination to head the Federal Housing Financing Agency, an open-seat contest has already attracted considerable attention, especially from black Democratic candidates seeking to replace the 20-year veteran legislator. In fact, most citizens who reside in some version of the 12th district have known no other member of Congress other than Watt, who captured the seat when the district was created in 1991. But this district has been one of the key litigated districts in the country, due to the fact that it is a majority-minority district and has become a powerful symbol of racial politics in the state and the nation. 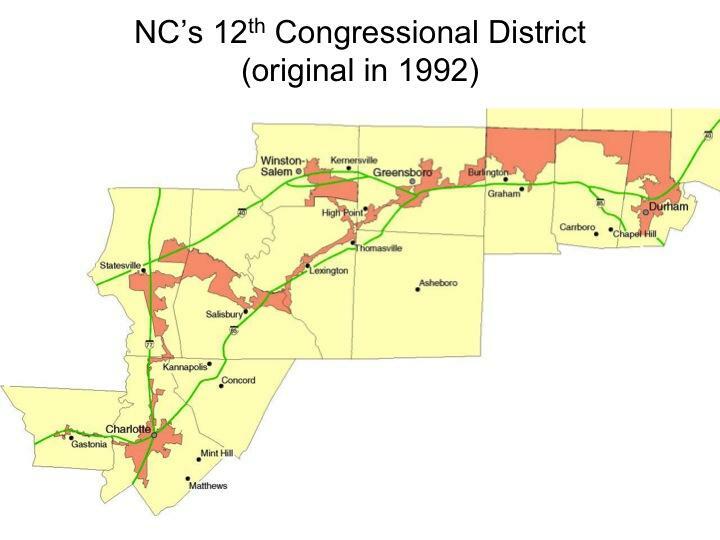 North Carolina’s 12th Congressional District was originally drawn due to President George H.W. Bush’s Department of Justice mandating that North Carolina create a second “majority-minority” district under the 1965 Voting Rights Act. The original district stretched over 10 counties, was approximately 150 miles long, and, in some areas, no wider than the I-85 highway that it traveled along. Stretching from west of Gastonia to the eastern parts of Durham, the legislature designed the district to bring in predominately black neighborhoods (and therefore black precincts). Through a variety of different versions of the district throughout the 1990s and 2000s, the 12th Congressional District was recently redrawn in 2011, this time by Republicans in control of the redistricting process. In keeping the 12th as a majority-minority district, the black population was 50.76%, while the voting age population was 49.5 percent; the district appears much more compact and Charlotte-centric (over 50 percent of the district’s population lives in Mecklenburg). But even with a more compact version, the 12th’s appearance may be in jeopardy, due to a pending court case that will test the legal basis for the district’s reason for existence. In the next two months (at about the same time as a potential special election for the 12th district), the U.S. Supreme Court will announce its decision in Shelby County v. Holder, a case challenging whether Section 5 of the Voting Rights Act remains constitutional, partly based on a formula created in the 1970s and at the heart of the 12th district’s existence. If the high court strikes down Section 5 of the Voting Rights Act, new challenges to the 12th district could emerge, along with the just announced hearings scheduled for this June over the GOP legislative redistricting maps. If the U.S. Supreme Court’s decision, the special election, and the current redistricting maps’ hearings converge at the same time, this summer could see more than just rising temperatures outside.